The Story: some 10 years ago before I had my own shop I hired out a company to make these bodies from me from some beautiful slabs of wood. They did an amazing Job. Next step sent them to a so called "painter" who did a HORRIBLE job. Not on purpose, the guy was new and cheap, and CHEAP is what I got. Things got busy busy and I had them in a box on a shelf for 7 or so years. Totally forgot about them. I resurrected two of them ( see last few photos ) took my TIME and stripped off the finish and the paint. Then I re-did them by Hand Staining them. Look at the FINISH , the GRAIN the Beauty on them. ( the Blue one and Brownish one ) That is what's underneath this Red Body waiting for YOU to put some sweat into and create a masterpiece. I don't have the time for this anymore. I want to pass this one on to someone like you. At the time of this post I have TWO of these bodies. One is already almost sanded to perfection. I also have two HIPSHOT bridges to choose from. Black or Chrome. If you want this body buy is NOW before it's too late. The pocket fits perfect for Strat Neck Fender Specs. Half Honduras Mahogany / Half Canadian Maple. 2 Humbucker Open. Set up for a HIPSHOT BRIDGE. Your's is Chrome. Comes with a laminate Back Cover & a Chrome HipShot Bridge. 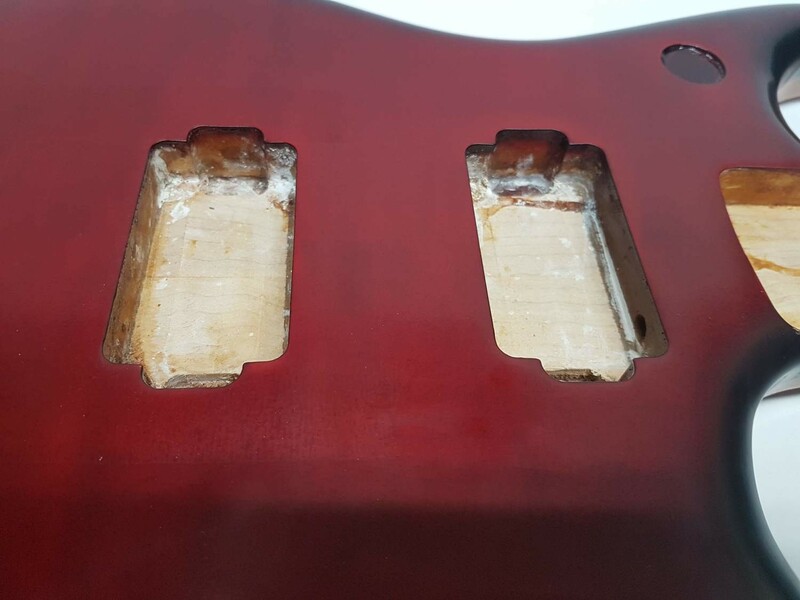 *Your purchase will be the RED QUILT Super Body, 1 Back Panel and 1 Hipshot Bridge Chrome.